For the next few days, we are going to be diving deep into the depths of Solomon’s soul, as he reflects on the meaning of life. In this text, he calls himself “the Teacher” which have caused some question as to if Solomon truly wrote the book or not. It was not until I read through the Old Testament that I realized that Solomon was more than qualified to write such a book. Although he was not a Prophet, God granted him great wisdom, since that was what his heart desired more than anything else 1 Kings 3:5-14. Ecclesiastes is written from the point of view of a Qoheleth - usually translated as preacher or teacher. 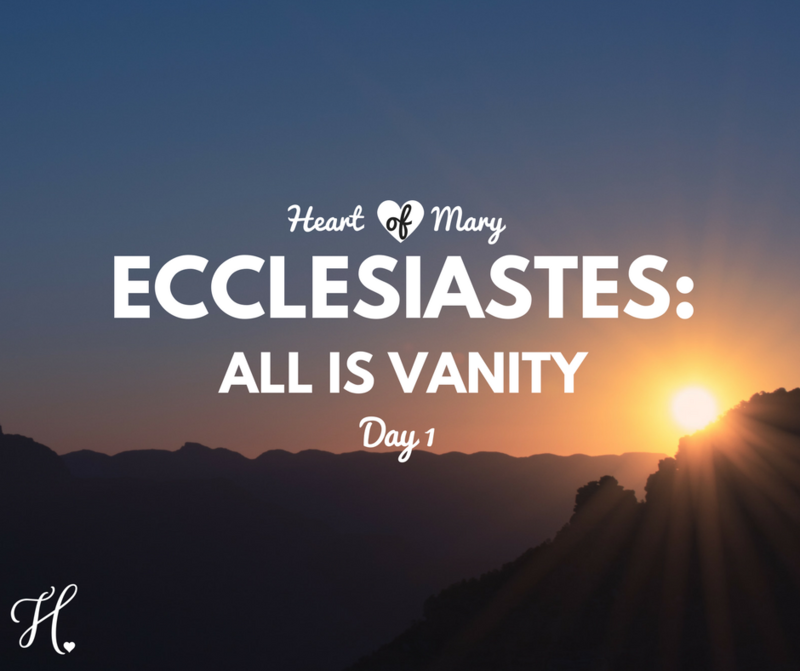 Ecclesiastes challenges us to confront the contradictions of life. This is more than fitting for our Year of Mercy, as the very definition of mercy begs us to be benevolent and forgiving of those who may not deserve it. That statement is particularly powerful because the book of Proverbs (directly pre- ceding Ecclesiastes) tells us a lot about what is to be considered vain or foolish, but in no way describes everything. He then goes on about how the earth remains long after our par- ents, grandparents, children, and we return to dust. So... why work? Why strive to leave a legacy? Noth- ing we have done is so great that it would even be remembered. I have always jokingly compared that last verse to Spiderman’s Uncle’s famous line, “with great power, comes great responsibility” and would even argue that the perhaps, the writer may have known himself a little Bible before adding in that line. Like Spiderman, we see the world differently as we age, and especially once we gain the life experiences that shape our inmost being. To be more informed on any- thing is both a blessing and a burden, as it grants us the ability to assist more fully, but also feel more deeply. It appears that some of our greatest traumas afford us the opportunity to seek God’s peace and strength and, later, help others who have gone through similar trials. If we only associate wisdom with pleasure, then it can surely be in vain but if we explore our hearts in discernment, we may be guided a different way.